FJO Water/Methanol Injection System UNIVERSAL - Dezod Motorsports Inc - Home of the automotive performance enthusiast since 2002. 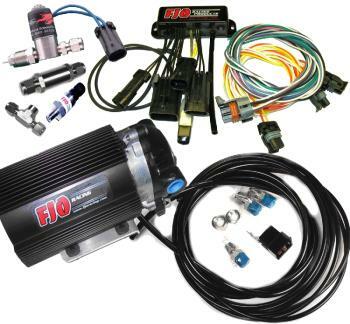 FJO Racing Products releases it’s standalone Water Injection System. This product is styled after the very popular water injection accessory of FJO 341B System. The use of water and methanol to control detonation in high compression or boosted engines is a time proven technology. This advanced product is engineered to deliver a fine mist that can be precisely metered based on MAP PSI, TPS, RPM, and Fuel injector duty-cycle. With the use of 1 and 2 dimensional maps, it is possible to program the controller to deliver exactly the correct amount of spray without the risk of flooding the combustion chamber. Our unique nozzle-solenoid design allows for instant control and delivers a mist so fine that complete evaporation is almost instantaneous. This results in a more effective use of the spray without risk of condensation in the intake. The FJO Water Injection system is constructed using materials which are engineered for and unaffected by water and methanol. To avoid compromising the performance of the system, materials such as brass, raw or anodized aluminum, raw or plated steel, natural rubber, and silicone should not be used as they are not suitable for use with water and/or methanol. Built to the same rugged specifications as all of FJO’s products, this system sets a new standard in water injection.